Fifty years after the 1953 Cadillac Eldorado, Style No. 53-6267SX, made an indelible mark on the American automotive scene, it became possible to sort out the facts from the fiction about these much admired and collected luxury cars. Determining the facts required a sheet-by-sheet search of the 109,658 Cadillac build sheets from 1953, which are archived in the General Motors Heritage Center in Sterling heights, MI. Special thanks go to the Heritage Center Manager, Greg Wallace for providing the access needed to accomplish this lengthy search.  What is "special" about the 1953 Eldorado? The Eldorado has a limited-production special convertible body that is quite unlike the standard 1953 Cadillac Convertible Coupe, Style 53-6267. The four fenders, trunk lid and floor pan are the only major body panels that are shared intact with the standard convertible; the hood, cowl, doors and body shell are coach-built by the craftsmen of Fisher/Fleetwood. The new, for 1953, wrap-around windshield was a precursor of a major forthcoming styling change to the entire General Motors line of automobiles. The also-special body of the 1953 Oldsmobile Fiesta had a similar wrap-around windshield and windshield frame, which are not interchangeable with the Eldorado. The long, low appearance of the Eldorado is not an illusion created by the low-cut doors and belt line. The 55/8 inch road clearance of the Eldorado is one inch less than the standard convertible and the overall height is three inches less, at 581/8 inches. Numerous subtle features including a padded dash board, unique interior upholstery treatments and a completely disappearing convertible top, distinguish the Eldorado from the standard convertible. The substantial amount of skilled labor and individual body work involved in building each Eldorado was expensive. Although I do not have factory cost data to prove it, it is likely that Cadillac lost money on every 1953 Eldorado but made up for it in publicity, prestige and public interest. It certainly did not hurt their reputation to have the new President of the United States, Dwight D. Eisenhower, parade through the streets in a new white 1953 Eldorado during his inaugural parade, accompanied by a fleet of new 1953 Cadillacs of various body styles.  How many 1953 Eldorados were built? Certainly, this is the most frequently asked and debated question. The answer is still 532. Summary factory production records in the Cadillac archives indicate that total production was 532 cars and exactly 532 individual Eldorado record sheets were identified in the sheet-by-sheet search. Yes, there is a body number 533 and that car exists, but one body number was not used. As is the case in other years and styles of Cadillac and LaSalle automobiles, the Eldorados were not assembled in a straight body-number sequence. Thus, #533 is the highest body number but NOT the last Eldorado built; there are 20 Eldorados with higher VIN (Vehicle Identification Numbers) yet LOWER body numbers.  How many survive? Pay no attention to the collector car dealers who tell you only a handful have survived. As of May, 2006, my latest confirmed count is 177, up from 165 in February, 2005 [the previous update of this page]. My educated guess is that at least half of the cars built still survive. When the late Cadillac-LaSalle Club Director of Technical Services, Don Frolich, and I started gathering data in 1992, we found that many owners did not want their cars publicly identified by body and VIN number. We respect that privacy and agreed to not publish owner identification without the consent of the owner. I will list original data for known surviving Eldorados that are posted in The Cadillac Database © and I encourage willing owners to fill in the current details for access by enthusiasts worldwide. Early on in this effort, the late Jerry Peukert of Staten Island, New York, shared with us survivor data that he collected over many years. Thanks also go to the owners who have provided their car data to me and to Yann Saunders, the Compiler and Administrator of The Cadillac Database ©.  Which car was used for Ikes inauguration on January 20, 1953? The speculation for years has been that it was body #1; it could not have been. Body #1 was painted Artisan Ochre (yellow); the build sheet is annotated Cars in Co. Use, Auto Show, New York Br. and in January 1953 that car was on display in the Waldorf Astoria Hotel in New York City. The build sheet for body #2 (Alpine White), VIN 536208900 says, Condition for inaugural parade and the Eisenhower inaugural car was definitely white. There are reports that body #2 was damaged in shipment to Capitol Cadillac in Washington, D.C. and replaced by another Alpine White car in time for the inauguration. The factory records do not support that thesis. Only two other Alpine White Eldorados had been built by inauguration day. Body #4 was a show car invoiced to Los Angeles on 1/20/53 and diverted to San Francisco. Body #3 was a show car invoiced to Buffalo, New York, on 1/27/53. I have spoken with Mr. Bud Tinney about the possibility of body #3 having arrived in Buffalo at an earlier date and been redirected to Washington, D.C. Mr. Tinneys father owned the dealership in Buffalo (he was the western New York distributor to eighteen other dealers) and Bud worked at the dealership. Mr. Tinney indicates that they did not send an Eldorado to Washington for the inauguration. Rumors have been widely repeated that the inaugural car was given to President Eisenhower as a gift. The factory records suggests otherwise. Eldorado #2 remained in General Motors ownership after the inauguration and was returned to the factory on 8/11/53; presumably to be refurbished for sale. It was shipped to New York City on 8/26/53 and the dealership reportedly sold it to a Mr. George Waterman. Eldorado #2 still exists and has traded hands numerous times.  Who was the original owner of my car # ---? Unfortunately, none of the 1953 Eldorado build sheets indicate the name of the purchaser. Dealers kept track of car buyers, Cadillac Motor Car Division did not. Copies of any 1953 individual vehicle build sheet are available from the General Motors Heritage Center for $50.00US. See the Cadillac-LaSalle Club, Inc. website [cadillaclasalleclub.org] and click on Authenticate your car in the left column of the home page for ordering details. Please note that the destination dealership listed on a build sheet may not be the dealer who sold your car. The cars frequently were invoiced to a distributor, who controlled distribution to multiple dealerships. Even if the selling dealer is known and still in business, it is highly unlikely that they will have records of sales from 1953. Only a few of the original owners are known from information supplied to or by the current owners.  Where were the cars shipped originally? The East Coast/West Coast debate has been resolved -many more went east than west - see the accompanying shipping destination chart. The 46 cars listed for Michigan may not reflect where they all were registered; 35 of those are shown on the build sheets as Driveaway  Detroit Order, meaning that the owner picked up the car at the factory or factory branch and may have driven it home to another state. Windsor, Ontario, across the river from Detroit, was the port of entry for cars to Canada, with only one car showing a Canadian destination  Alberta.  How much did a 1953 Eldorado really cost? To date I have not seen an actual bill of sale for a new Eldorado. If any reader has a copy of a dealer-to-customer invoice (Bill of Sale), please share it with us. The most frequently quoted retail price is $7,750. Thus, a no-option car delivered to the Detroit Branch was dealer invoiced at $5738.12. A fully optioned car delivered to Los Angeles was dealer invoiced at $6222.61.  Were each of the Eldorados built to order? Unlike earlier years, the 1953 records do not have an S.O. / S.B.O. (Shop Order / Special Body Order) block to indicate special orders. Clearly, the cars that are listed on the build sheets as Cars in Co. use, or Show Car, were not built to fill a customer order. None of the Eldorados were painted in a special, non-standard color  a sure indication of a special order. Four exterior colors were specifically designated for Eldorado  Artisan Ochre, Alpine White, Azure Blue and Aztec Red  a total of 462 Eldorados were built in those colors. Seventy additional Eldorados were built in other standard 1953 Cadillac colors. It is likely that all 70 of those cars were for specific customer orders; the company certainly would not build a Phoenix Beige Eldorado for stock. My opinion is that all of the cars with E-Z-Eye tinted glass and/or Autronic Eye were also for specific customer orders. It is not possible to determine from the factory records whether or not some Eldorados were built for stock, but I doubt it because of the vehicle price. One black car was done with Black leather entirely with red thread saddle stitching, for an additional charge of $13.75  that was certainly a special order for a particular customer and that car survives.  Factory standard tires: Firestone - 110 cars; Goodrich - 43 cars; US Royal - 379 cars.  E-Z-Eye tinted glass (Accessory code E) - 316 cars (59% of production).  Autronic Eye headlight dimmer (Accessory code U)  76 cars (14% of production).  Left side spotlight kits specific to the Eldorado (part # 929484, $23.30 and a right side spotlight mounting bracket # 897016, $2.20) are listed in the Cadillac Master Chassis Parts List. The factory did not install any spotlights on Eldorados; existing units are dealer or owner installed.  Door edge guards and radio tuner foot control switches are genuine Cadillac accessories that are appropriate for an Eldorado, but not listed on any build sheet.  Cadillac did not offer a continental kit and none were installed by the factory. Dealerships sold and installed a variety of models by aftermarket manufacturers, which are found on numerous Eldorados today.  Power brakes were not an option on any 1953 Cadillac (only one unit, a Series 6019 sedan, was built for the factory account of Cadillac General Sales Manager James M. Roche). 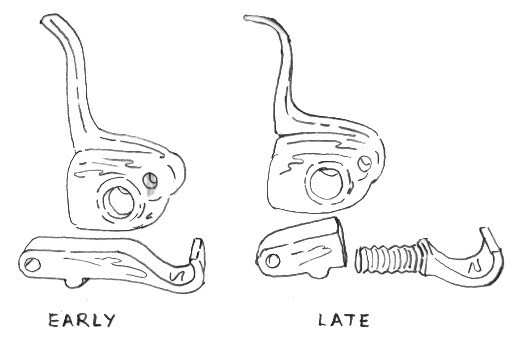 Power brakes became available on the 1954 model year Cadillacs and the factory subsequently offered a "Power Brake Package, 1950 thru 1953, part #146 2266, $73.90." It is described in the Cadillac Master Parts List as a "Complete installation package". Numerous Eldorados have since been fitted with power brakes and I welcome details from current owners. From an authenticity standpoint, I consider power brakes on a 1953 Eldorado to be authentic if installed from a factory kit.  Transmissions. All Eldorados were equipped with the standard Hydra-Matic transmission. The build sheets for Eldorados assembled after the disastrous August 12, 1953, Hydra-Matic transmission factory fire, are annotated HYDRAMATIC. After engine number 84799, only the Eldorado and series 75 cars continued to receive the Hydra-Matic; all other body styles were fitted with the Twin-Turbine (Buick Dynaflow) transmission. Two known surviving Eldorados have subsequently been fitted with three-speed Synchromesh standard shift transmissions. Only nineteen passenger cars (series 6019, 6219, 6237, 7523, 7533) and many commercial chassis were built with Synchromesh in 1953; the last year for that option.  Convertible tops. The Eldorado top material was very distinctive. It was made of a shiny synthetic fiber (Orlon) and only available in two colors: White (code 1) or Black (code 4), the interior of the tops was black. Very late in the production sequence, 13 Eldorados were built with White Orlon top with tan lining 28T1553. The metal convertible top frames were similarly painted tan instead of black. The 1956 Cadillac Master Chassis Parts List erroneously indicates that only nine cars had the tan top lining. I have been unable to determine if the tan lining was a special no-additional-cost offering or if the factory just decided to build them that way. tell the compiler of the Database when the change was made (what body number)?  How do I identify my car (or one that I see) - where are the numbers and what do they mean? All cars built by Cadillac are identified in the company records and for registration purposes (the Vehicle Identification Number) by the original engine serial number. Irrespective of body style, the vehicles were built in an ascending engine serial number sequence as they passed down the assembly line; the first four digits indicate the model year and body series, followed by a five or six digit build sequence number; e.g. : 536208900 for Eldorado body #2. No Eldorado was built with a sequence number of 90,000 or higher. The VIN number appears in at least three places on the Eldorado: on the white plastic lubrication plate adjacent to the door latch striker plate on the drivers side; on the flat machined surface on the front of the right-hand cylinder block (just in front of the valve cover) and on the horizontal (top) right chassis side bar just behind the front cross member brace. The VIN number in all three locations should be the same. Today, many of the plastic lubrication plates are missing, numerous engines have been changed and you have to scrape and clean the top of the chassis to read the number. If the engine and chassis number are not the same, you can send me all of the numbers and I can determine which one is correct  most likely the chassis number is correct. I can identify any 1953 Eldorado from the VIN number or the body tag information. An unpainted aluminum body tag is riveted to the firewall (cowl) adjacent to the inboard end of the battery carrier, in the engine compartment. The Style No., 53-6267SX, is found only on the body tag and in factory literature. The model year is 53, 62is the body series, 67 denotes Convertible Coupe, S denotes Special Sport (Eldorado) and X indicates power windows and seat. which are standard factory equipment on the Eldorado. On the build sheets, the Eldorados are identified as Style No. 6267S. Although the cars are listed as having Fisher bodies, the bodies were built in the Fisher/Fleetwood plant and the tags carry a Fleetwood body number, e.g. FW 289. Trim codes are indicated as a three digit number on the build sheets (438 for car# 289 above); the first number (4) being the top color (Black) and the other two digits (38) indicating the leather interior combination  Red Leather with White Leather. Trim numbers and top number are indicated separately on the body tag. S is the Black color family, for upholstery codes 34 or 35. T is the Blue color family, for upholstery codes 32 or 33. U is the Red color family, for upholstery codes 38 or 39. Use of a color family code on the body tag enabled the body builders to select and install the correct color interior components without any other written instructions (upholstery, carpet, interior door handle grips, steering wheel, etc.). The last data line on the body tag identifies the convertible top color (#1 for white, #4 for black), followed by an accessory code. Acc. E appears if the car is equipped with the optional E-Z-Eye tinted glass; Acc. P indicates plain glass. A one or two digit number at the end of the line is a date code, presumably the day of the month that the body was scheduled to be ready for transport by truck to the Clark Avenue vehicle assembly plant in Detroit. The clues to the color family concept came from 1958 Cadillac data provided by Carl Stoutenburg. I finally ascertained that there is a day of the month code by correlating the body numbers of 61 individual body tags, from owners around the world, with the associated day number. The day of the month numbers repeat perfectly from 1-30; as the assigned body numbers increase.  Technical Documentation. The mechanical, electrical, chassis and body aspects that are NOT unique to the 1953 Eldorado are dealt with in the 1952 Cadillac Shop Manual and the companion 1953 Cadillac Shop Manual Supplement. The 1953 factory publications Air Conditioning in Cadillac Cars and Cadillac Twin-Turbine Transmission Service Manual are not germane to the Eldorado. To my knowledge, there is only one piece of technical literature that addresses the unique aspects of the 1953 Eldorado; the Body by Fisher Service News Bulletin, Fisher No. 10, Vol. 12 of 5-13-53. The 20 page bulletin deals with how to operate the top; folding top adjustment; windshield removal and installation; door wind deflector assembly; folding top compartment cover; folding top care & maintenance; electrical equipment & wiring installation. This item of technical literature is not easy to find. Fortunately, I have been provided kindly with a copy by Eldorado owner Gerald MacPherson of Bangkok, Thailand. With his permission and space permitting I shall have it included shortly as an appendix to this section or have a hyper-link to it from here. Watch this space. Numerous times I have been asked if there is a separate Owners Manual for the 1953 Eldorado? As far as I can tell, there is not; does anybody know otherwise? There is a separate Body by Fisher pamphlet, entitled How to operate the folding Cadillac Eldorado top. The fifteen page 4 ½ x 6 glove compartment pamphlet is a very rare piece of original literature. It contains written instructions and very detailed step-by-step photographs of the lowering and raising procedure, including strapping the top framework down on both the left and right sides to prevent chafing of top material, before closing the top compartment cover. OK guys and gals; that is a summary of my findings about the 1953 Eldorado. Now it is your turn to add to the body of information. We need Eldorado Scouts all over the world (especially in Europe) to identify every 1953 Eldorado that you see in an auction, at car shows, in musty garages and in scrap yards. I solicit additional surviving car information and questions from any and all readers; your anonymity will be respected if that is your desire. Enjoy our hobby! Matt is a Life member of the Cadillac-LaSalle Club, Inc.
© 2004, Matt Larson and the Cadillac-LaSalle Club, Inc.